2019 marks 15 years in Worcester! "Well-Being Series: Yoga, Mindfulness & Meditation"
Treat Yourself to the experience of mind body wellness and peace in a welcoming and inclusive environment. Take action to make yoga and meditation part of your life. to update it with the most current version of this Daily Calendar. to update it with the most current version of the Daily Calendar. Click on a class title to open the full description. Be sure to check this Daily Calendar before coming to class. Interested in correcting the imbalances of modern life in Western culture? Yoga is by no means a "cure-all" but it is a wonderful place to START and a valuable life-long skill. For example: Yoga can get you to a point of feeling more relaxed which provides quality sleep, which may lead you to making better decisions which could help you make healthier choices throughout your day. In a modern life "wheel of well-being" some of the many spokes include: yoga, mindfulness, meditation, quality sleep, creating a mind-body connection, active relaxation, shared human experiences, finding purpose, communing with nature, enjoying whole foods, managing negative stress and emotions, being accurate in your speech, avoid toxins (such as toxic people, toxic chemicals, toxic technology)... It's a lot to learn, navigate and implement! A clear head, kind heart and comfortable body from yoga can launch you into a moment of being positive and balanced to intentionally take action and build toward well-being. 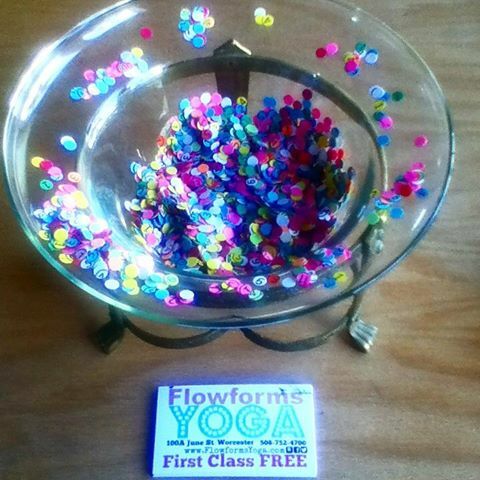 Thank you for reading this and considering experiencing yoga. Come on in and treat yourself! 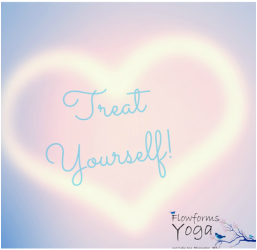 Practice Peace & Treat Yourself!